Absolutely stunning, exquisite pan. Bill exceeded my lofty expectations with his expert craftsmanship and ongoing communication through project completion. Most strongly recommended. The Majestic Fountain Pen offers pen aficionados distinctive style and flair in a collectors grade pen. Its regal profile is accented with brilliant 22kt Gold plating on all components which showcases a sparkling Swarovski clear crystal on the clip. Select pieces of Burl Caps and Dark Red Colored Alumilite are combined to create this beautiful Cancun design custom writing instrument. The accents rings, bands and caps are custom casted 3D raised designs. 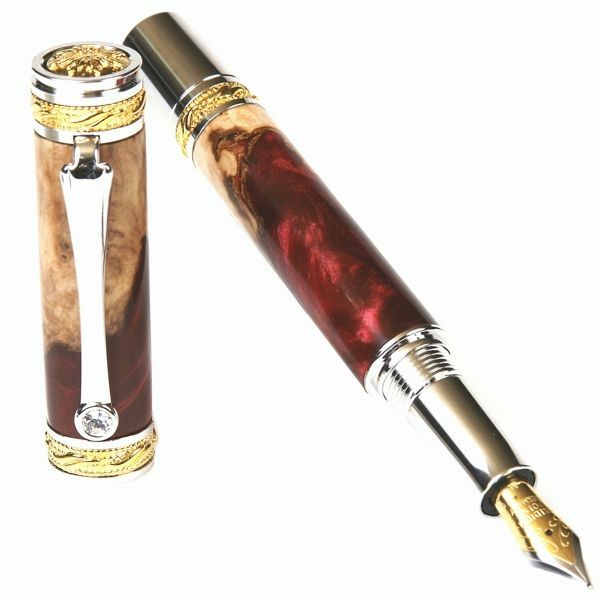 The combination of rich 22kt Gold hand-cast engraved insets, a top quality German made rhodium plated medium tip nib with genuine iridium point for smooth writing and dependable ink flow and a body designed from select Red Tide to make a distinctive pen of unrivalled beauty. Every maker has a story. Be a part of Pens By Lanier's story by placing an order, leaving a review, and seeing your review appear here.